The mission of this program is to teach people about the forest pest problem. Fly tying is a great way to gain attention for the education message but the important thing is the message. Forest pests affect us all and anyone can help spread the word. Invasive pest insects are a significant threat to our urban and wild forests. Gypsy moths, Asian longhorned beetles, Sirex wood wasps and many other species have the potential to devastate our tree resources. Just one species, the emerald ash borer, has killed tens of millions of trees and is rapidly expanding to uninfected areas. 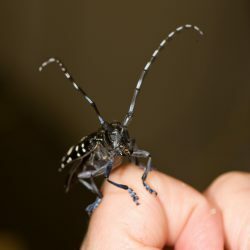 The increased pace of global shipping has increased the ability of invasive insects to reach North America and we all need to take action to help protect our trees. The best hope we have of dealing with these these invasive pests is to discover them early and the best way to do this is if lots of people are looking. ISAN has developed a unique program that teaches people to recognize and report some of the worst invaders. This program uses fly tying as a basis for educating about the problem. Few people spend more time looking at insects than fly anglers and they are can be a great resource in the effort to identify new introductions. Through the Forest Pest Fly Tying Project professional and recreational fly tiers learn to tie fly patterns that accurately represent the insects we are concerned about. These trained tiers attend fly fairs and sport shows and teach others about the problem and the solution. Tiers are the backbone of the program and we need your help! We need tiers of all skill levels to help in various ways. In all cases we are able to supply fly tying materials if needed. 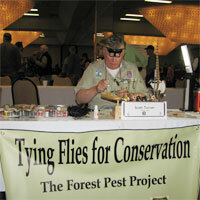 Demo tiers learn to tie realistic pest flies and conduct public demonstrations to teach others. We provide demo tiers with lots of support materials – information cards, handouts, banners, etc. We need demo tiers in all parts of North America. Production tiers help by tying the flies that we use as handouts when we present the program to the public. At a busy sports show we can easily give away more than a hundred flies a day so we are always seeking tiers who are willing to send us flies for this use. Realistic tiers help by tying the most realistic flies possible. We use these flies to teach about the program. They are especially useful when we present the program to non-anglers who are typically unaware of the ability of tiers to accurately represent any insect. We use realistic flies to accompany magazine articles and in many other ways. You can learn a lot more about the program by downloading our Forest Pest Project Fly Tiers Handbook. Volunteer: You can learn a lot more about the program by downloading our Forest Pest Project Fly Tiers Handbook. Contact Us: Questions, ideas, or want to volunteer? Feel free to contact us. Report Sightings: Learn to recognize the pest insects that are of most concern – if you ever see one report it immediately to your local USDA Forest Service, USDA APHIS, Conservation District, Extension office or state forestry department. Don’t Move Firewood: Use local wood when you go camping. Learn more here: https://www.dontmovefirewood.org/.